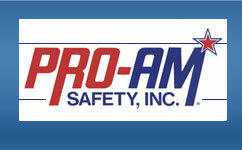 Pro-Am Safety is a direct distributor of over 300 manufacturers. Below is a list of suppliers for products we currently have online. Just enter the company name into our search feature to view their products. If there is something you are looking for that is not on our website, give us a call and we will be happy to assist you.